All books available from the Bridge Winners store are eBooks. All eBooks and software can be downloaded immediately after purchase. 2017 IBPA Book of the Year! Available as eBook for $16.99, or as paperback for $18.95. To buy the eBook version, click "Add to Cart." An in-depth 'over-the-shoulder' look at top-level bridge. While describing almost 200 deals that he played in World and European Championships, one of the world's best players, Boye Brogeland, discusses bidding and cardplay, as well as his approach to the mental side of the game. A fascinating glimpse into the thought processes of a champion bridge player, as well as a look at state-of-the-art bidding methods, some of which are described here for the first time. In this book, written for serious tournament players, Miles addresses the the complex arena of competitive bidding methods. Miles discusses current thinking, and recommends methods which will continue to be playable as bridge enters the 21st century. This book will appeal to more serious readers but can be enjoyed thoroughly by the advancing player. American Bridge Teachers Association Book of the Year Award Winner Eddie Kantar's various beginner books have sold hundreds of thousands of copies in ten different languages, not least because of his unique style and the humor that he introduces into the learning process. Advanced Bridge Defense is intended to cover some of the more complex concepts of bridge defense for the modern advancing player, and will undoubtedly be a standard teaching tool and reference work for the next quarter-century. The topics covered here (planning the defense, inferences, various ways of counting the hand, developing extra trump tricks, falsecarding, and lead-directing doubles) are handled so thoroughly that even more advanced players will benefit from studying this book. Designed to be used by bridge teachers, or by students learning on their own, this book contains a host of features that help the student to grasp the material: clearly laid-out concepts, margin notes, practice hands, chapter-end quizzes, key-point summaries at regular intervals, and an index. 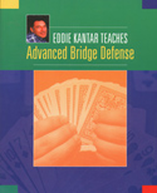 It is intended to be read after the companion volume, Eddie Kantar Teaches Modern Bridge Defense. Imagine sitting beside a world-class bridge player and being able to listen to his thoughts as each hand develops... you can help but improve your own game! Every hand in this fascinating book comes from actual play; many of them are taken from the author's own experience in world-level competition. Fred Gitelman believes that there is something to be learned from every bridge hand, whether you are a novice or an expert, and he proves it here. Just as fascinating as the bridge, however, are Fred's observations on his partners and opponents, who range from world champions to famous amateurs like Bill Gates and Warren Buffett. Matchpoints, originally published in 1982, is one of the absolute classic bridge books. World Champion Kit Woolsey discusses every aspect of bridge -- constructive bidding, competitive bidding, declarer play, defense -- from the perspective of matchpoint expectation: how many matchpoints will I win if I am right, and how many matchpoints will I lose if I am wrong? Even veteran matchpoint players will take a lot away from Matchpoints. This is the second edition (2015), which has updated the bidding to be consistent with a modern 2/1 game-force bidding framework. Available as eBook for $19.99, or as paperback for $24.95. To buy the eBook version, click "Add to Cart" below. This is two books in one. You can treat it is an advanced text on declarer play, trying to solve each problem hand as it comes up. Or you can just relax and enjoy finding out more about these Polish stars who have won more international medals than the players from any other country over the last twenty years. North America's oldest and most prestigious bridge magazine, The Bridge World features a monthly column entitled 'Test your Play', which presents difficult problems in declarer play for readers to solve. This is a collection of some of the best of these from the last twenty years; if you can solve even half of them, you may be one of the best declarers in the world! Built around real-life deals featuring the bridge-playing rabbi, Leonard Helman, this book contains a wealth of tips on bidding and play for the advancing player. Even experts will learn from some of the bidding ideas, drawn from Eric Kokish’s encyclopedic coaching files. In The Rodwell Files, Eric Rodwell, widely regarded as one of the best bridge players in the world, has transformed his years of accumulated notes about various bridge situations into a comprehensive book on bridge. In The Rodwell Files, Eric Rodwell gives you a rare glimpse inside the mind of one of the world's best bridge players. He allows the reader to learn his approach towards both declarer play and defense. Rodwell explains the factors he considers and how he decides on a specific line of play. Rodwell also illustrates his strategies with real-life examples from tournament play. The wide range of topics covered in The Rodwell Files get increasingly difficult as the book progresses. He refers to these topics and situations through various creative names he devised over the year, some of which are already working their way into expert bridge players' conversations. This is one of the top bridge books in recent years, and is a must read for any aspiring player.